Ok, chugging right along on my WIPs! 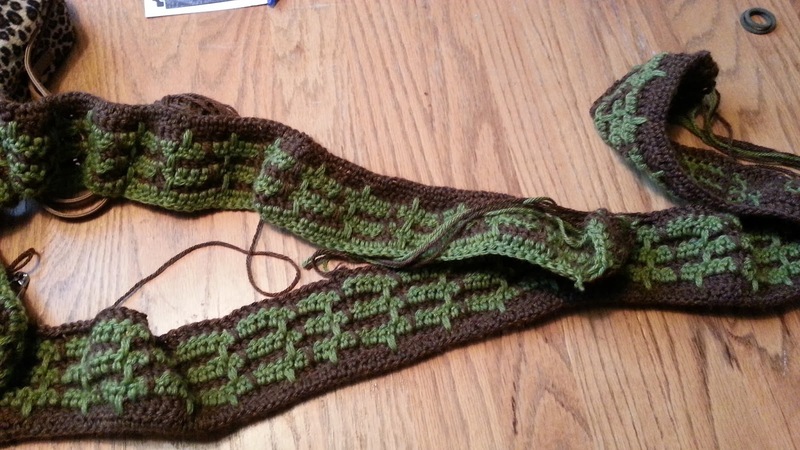 I'm almost done with theonlyboyfriend's scarf. Or I should say I'm almost out of yarn. I think it might be too skinny for his tastes though. That's all I have of his yarn, but I DO have some other brown yarn, but it's a different shade and brand. So I don't think it will work. I'll finish it up tonight and see what he thinks. If he doesn't care of it, to charity it goes! And I'll make him another one in the future. The Ugly blanket, I was wrong about having enough yarn to finish. I do not. So it's back in the closet waiting for more scraps. And that's ok. No deadline for this one or anything. I have yarn and two patterns set aside for my next projects. We're going on vacation here shortly, so I'm leaving them aside for that! I can't wait. :D A week of reading and hooking and naps. That's about it for my WIPs this week! Next week I should have one of the others started, if not finished. I hope everyone is well. Much love and happy crafting!! !